Call it religion or the nature of a substance, it is eternal. How is that - like bitterness in salt and sweetness in sugar is eternal because it is their nature, so the question of since when does not arise. In a similar fashion, the soul's nature to know is eternal and will remain so. All the souls and matter particles all reside within their nature. But the concept of the soul as a knowing entity and all the other souls and matter being separate from the self was professed by all the 24 Tirthankars from Adinath bhagwan to Mahavir bhagwan. We have received this from Mahavir bhagwan because it is his reign. Before Gautam garndhar arrived, it was not time for Mahavir bhagwan's divine voice to be released, so for 66 days there was no release of divya dwani. At that time Indra knew from his avadhi gnan (clairvoyance) that Gautam swami was the correct person to be garndhar(receiver of the divine voice) but at present was a bhramin. Indra asked him questions on 6 dravya, 7 tatva, 5 astikay but since Gautam swami did not have this knowledge, he asked Indra to take him to his guru (teacher). Indra took him to Mahavir Bhagwan's samavsharan (religious conference). On first seeing the manasthambh (pillar of humility), Gautam's pride in the Bhramin religion was dissolved and his knowledge became samyak (correct). 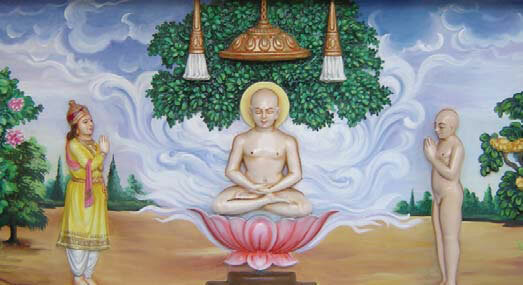 As he went further into the samavsharan towards Mahavir bhagwan, his internal state became purer and he achieved muni dasha (monkhood), and his knowledge became absolutely pure and achieved knowledge of 12 ang and 14 poorva at the same time as Mahavir bhagwan's divine voice was released. Govardhan and Bhadrabahu within the next 100 years, of which Bhadra bahu swami was the last - they all possessed knowledge of 12 ang and 14 poorva. Up to that point, the flow of knowledge was intact.